Cacoo is a cloud-based drawing tool that supports real-time collaboration. It’s a user-friendly software that allows you to create diagrams including; UML (Uniform Modelling Language), wire frames, site maps, flow charts, and network charts. The platform is a great choice for administrators with multiple contributors that require close monitoring. In addition, if you are working with team members or clients outside your office, Cacoo has robust features that make it an excellent choice. The tool sports varieties of stencils that make it easy to draw all the diagrams you want. Moreover, Cacoo has an in-built store with predesigned icon sets and templates that can be used in all diagrams. Cacoo has made the art of real time collaboration a reality. It allows multiple contributors to access and edit diagrams in real time. It helps individuals to make changes to one diagram at the same exact time and all the changes are shown as a soon as they are made. Also, within its flowchart software, there is a reliable chat feature. This feature allows users to exchange ideas as they make the changes on the diagram. It provides a thriving environment that redefines the world of collaboration. It makes you feel like your team is working in one room. Besides, the software gives you the freedom to manage all the collaborators for a diagram. You decide who can view or edit all the diagrams you are managing. It also features effective memo fields that let you monitor the exchanges and ideas or keep track of the individuals involved with each collaboration. 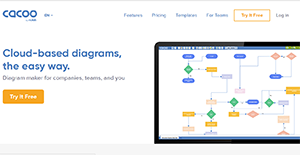 Moreover, this diagram software features several predesigned shape libraries and templates including those for mind maps, flowcharts, floor plans, organizational charts, infographics, UML, wireframes, network maps, and more. You can easily edit the color scheme and the text of each of the pre-made objects. Besides, Cacoo gives you the freedom to add additional symbols and shapes using the drag and drop feature. If you are considering Cacoo it could also be a good idea to examine other subcategories of Best Mind Mapping Software listed in our database of B2B software reviews. Every enterprise has its own characteristics, and can call for a specific Mind Mapping Software solution that will be fit for their company size, type of customers and staff and even particular industry they support. You should not count on getting a perfect solution that will work for each business no matter what their history is. It may be a good idea to read a few Cacoo reviews first and even then you should pay attention to what the solution is supposed to do for your company and your employees. Do you need a simple and intuitive app with just elementary features? Will you actually use the advanced functionalities required by pros and large enterprises? Are there any specific tools that are especially practical for the industry you work in? If you ask yourself these questions it will be much easier to find a trustworthy service that will fit your budget. How Much Does Cacoo Cost? We realize that when you make a decision to buy Mind Mapping Software it’s important not only to see how experts evaluate it in their reviews, but also to find out if the real people and companies that buy it are actually satisfied with the product. That’s why we’ve created our behavior-based Customer Satisfaction Algorithm™ that gathers customer reviews, comments and Cacoo reviews across a wide range of social media sites. The data is then presented in an easy to digest form showing how many people had positive and negative experience with Cacoo. With that information at hand you should be equipped to make an informed buying decision that you won’t regret. What are Cacoo pricing details? What integrations are available for Cacoo? If you need more information about Cacoo or you simply have a question let us know what you need and we’ll forward your request directly to the vendor.